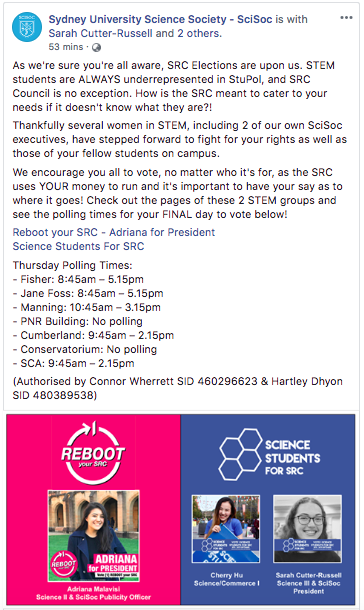 USU Board Director Connor Wherrett has authorised a Facebook post by Science Society which endorses SRC candidates in violation of USU rules. A second breach of the same kind has been made by Food Wastage Fighters Society. The first breach is by the Science Society, a Faculty Society within the USU’s Club’s and Societies program, and consists of a post relating to this week’s SRC elections. The post, made on Wednesday night, describes two separate SRC campaigns and features their promotional material: the council ticket Science Students for SRC, and Reboot, the presidential campaign of Labor-aligned Adriana Malavisi. The post was made by SciSoc president Sarah Cutter-Russell, who is running on the Science Students ticket. Malavisi, meanwhile, is SciSoc’s publicity officer, and, according to Cutter-Russell, “cleared the post” before it went live. Both women are science students, a fact mentioned by the post. Wherrett, a Labor Right member, is Malavisi’s campaign manager. The SciSoc post falls under the rules of two of USyd’s main student bodies, the SRC and the USU. The post breaks USU policies, but does not run afoul of any SRC rules. As a USU society, SciSoc is bound by USU’s Clubs and Societies (C&S) Handbook. Policy 7 bans society resources from being used to endorse a political candidate as part of a campaign for a University organisation; this policy extends to candidates running for the SRC, and further defines resources as including “general correspondence”. The post is also SRC political advertising, and therefore comes under SRC regulations, which require all political messages to be authorised by an undergraduate student. Wherrett’s authorisation fulfils this requirement: the post was cleared by SRC Electoral Officer Karen Chau and it is not alleged the post breaks SRC rules. Yet Tai seemed to take a less rosy a view of the post, and of Wherrett’s actions. “I will be having a serious conversation with any Board directors involved,” she said, though stopped short of suggesting sanctions could be applied. Under the USU’s Directors’ Duty Statements, all directors must abide by the regulations of the USU. If, by supporting a post that violates the Handbook, Wherrett is found to have breached the regulations, he may be censured by other Board directors. Soon after his first statement, Wherrett contacted Honi, saying he had now requested his authorisation to be removed. But SciSoc is not the only USU society to fall foul of policy 7. 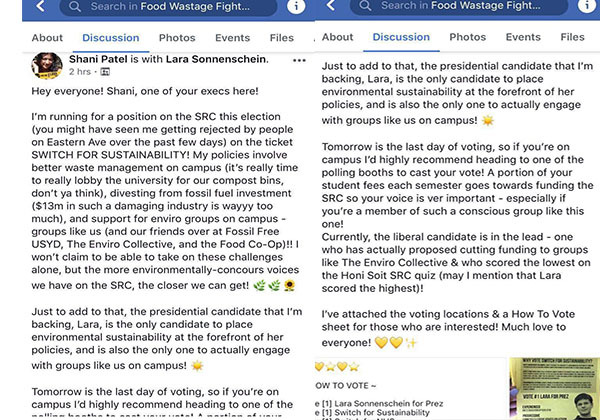 Shani Patel, an executive member of the Food Wastage Fighters Society, made SRC-related posts on that society’s closed Facebook group, also on Wednesday night. Patel is running on Switch for Sustainability, a far-left ticket supporting Grassroot’s Lara Sonnenschein for president. Patel posted an entire how to vote card, instructing society members how they could cast a ballot for her and for Sonnenschein. If SciSoc and Food Wastage Fighters are found in breach of the Handbook, the USU Board may take disciplinary action. Such action can include a written warning, removal of program privileges, suspension of funding or the removal of executive members.